Leroy Popowski (Juwi – Slipstream) and Rhae Shaw (Liv Giant) were the first placed men’s and women’s riders at the Fire Road 100km race on Saturday. 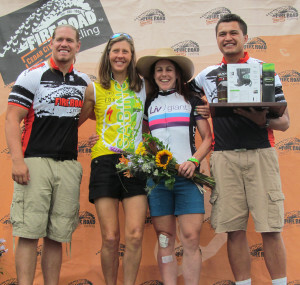 Both riders have a strong road racing background, with limited mountain biking experience, but this didn’t hold them back from laying it all down, not only winning the overall title, but each earned the KOM and QOM title for the 7 mile section on the first climb. Poposki, who lives in Colorado Springs, has been in the region before having competed in last year’s Crusher in the Tushar. 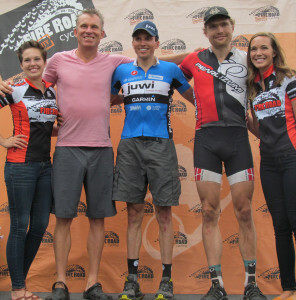 However for Canadian Rhae Shaw, now based in Boulder, CO this was her first mountain bike race! Popowski rolled in with a time of 3 hours 53 minutes, besting last year’s winner Paul Thomas by 10 minutes. Confident of his hill climbing prowess, Leroy pulled away from all KOM contenders on the first big climb of the day, gapping his rivals by 8 minutes within the first 17 miles, and then continued solo to the end. Although much of the race is on smooth dirt roads, some downhill sections feature very loose gravel, and some nasty eroded double-track, where Leroy confessed to an unintentional “dismount”. However he emerged from the dust unscathed to finish off the race. Shaw also dominated the women’s field from the outset, flying up the climbs with unrelenting power. She flatted not long after the top of the first climb, and being unused to the absence of a support wheel car, wasn’t sure what happened next! She gratefully received assistance from the next rider to come by, and continued her charge around the course. Wisely admitting her lack of mountain bike descending skills saw her choose to hike-a-bike some of the technical downhill sections. Despite these setbacks, Shaw rolled in after 4 hours 26 minutes, besting local pro Meghan Sheridan by 19 minutes and setting a new women’s course record. Both winners payed tribute to the awesome organization of the event, and the friendly and helpful volunteers from Cedar City. And they promised to come back next year to defend their titles.